Can you zoom the chart out some more? 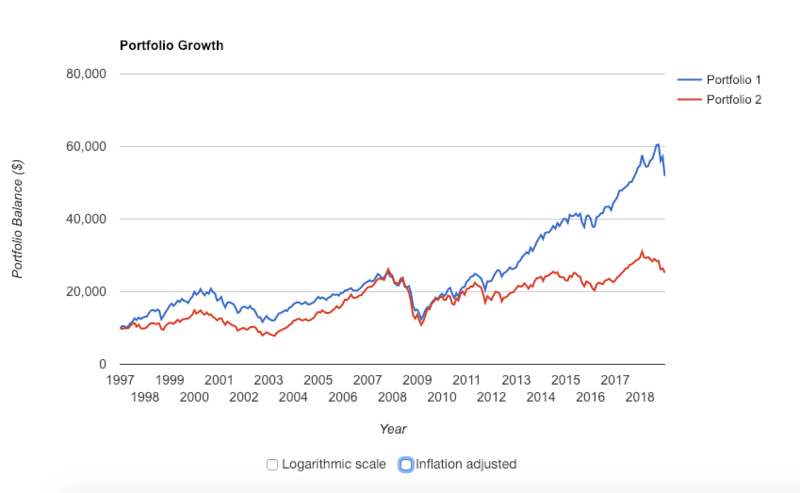 I want to see the previous 20 year performance. I happened to convert some after a 20% drop once before, but I wouldn't wait around for it, you might be waiting a while. If you are ready to convert just go ahead and do it. Topic: Any reason I shouldn't shorten duration on my treasury bonds? Re: Any reason I shouldn't shorten duration on my treasury bonds? It's not an unreasonable move. Over a long horizon it probably won't matter much, but over a few months or years it may help you a bit. BIL ETF is a treasury bill ETF that trades commission free and has a yield around 2.4% (before expenses I think). Topic: What is your favourite non-total market/SP500 ETF? Re: What is your favourite non-total market/SP500 ETF? My favorite ETFs are those that have the worst trailing 5-10 year performance. So right now that would be gold miners (GDX/RING), energy (VDE/FILL), & EM value (PXH/FNDE). In 5 years it will probably be something else. No, because there are hundred of leveraged and inverse ETFs with tickers. Just look at SQQQ, SH, TBT, etc. All have tickers, and all are funds I would never invest in. SQQQ, which shorts the Nasdaq, is down 99.75% since inception in 2010. Topic: Should we convert all tIRA money to Roth? Re: Should we convert all tIRA money to Roth? Should we convert all tIRA money to Roth? Topic: What's the relationship between bogleheads and Vanguard diehards? Re: What's the relationship between bogleheads and Vanguard diehards? I think they are one in the same. Before the Bogleheads forum it was the Diehards forum, IIRC. You can still find the old diehards forum using any search engine you like. Topic: How Do You Decide When to Do Certain Car Maintenance and Repairs? Re: How Do You Decide When to Do Certain Car Maintenance and Repairs? Topic: What investing strategy do you consider most ideal (two scenarios)? Re: What investing strategy do you consider most ideal (two scenarios)?